Following on from our weekend at the Emirates Palace, I thought it was about time I also let you in on what the West Beach Club is all about. I’ve had the good fortune to be able to visit on a couple of occasions now, one of them being when I went along to the first stand up paddle festival which you can read about here if you missed it. 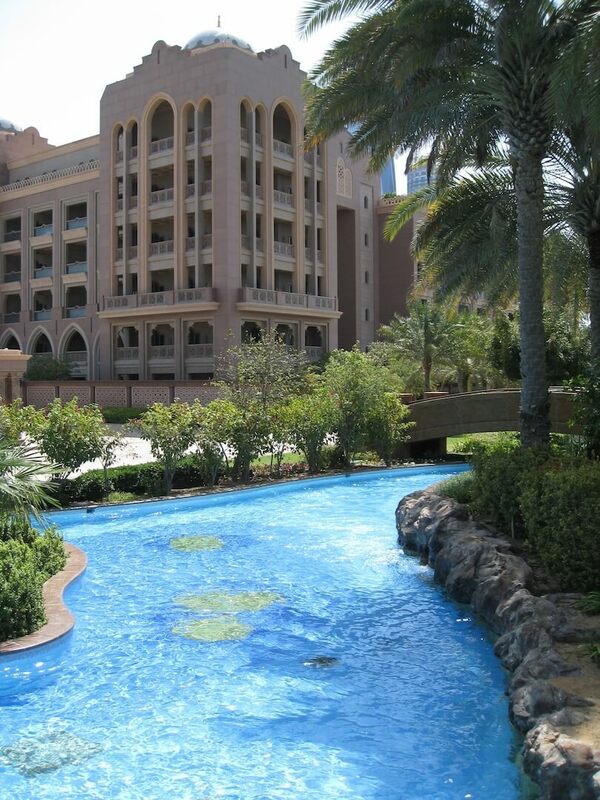 The West Beach Club at the Emirates Palace Hotel is the club that is open to members and the public, with the purchase of a day pass. I’m not sure many people realise that you can go in on a day pass, as certainly for many years it was only open exclusively to hotel residents and members. 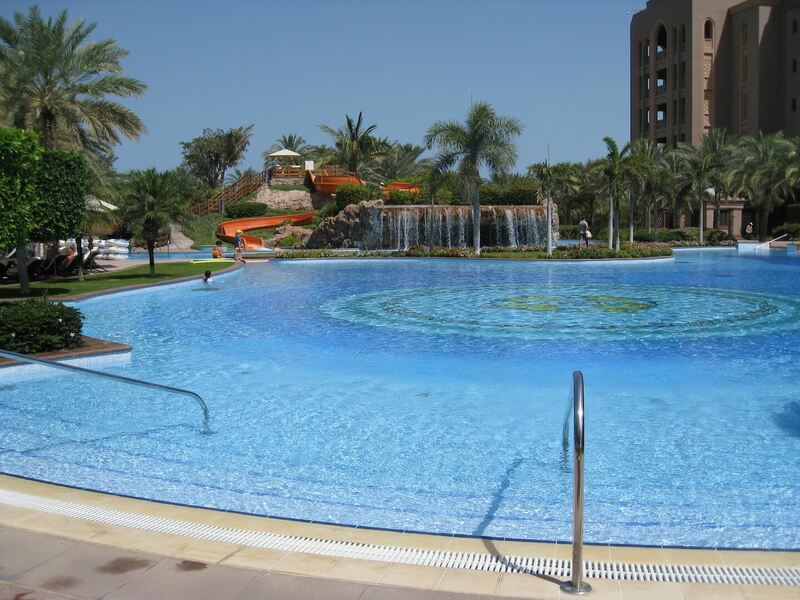 The West Beach club is where the kids club or as they like to call it, ‘Sarab Land’ is located. 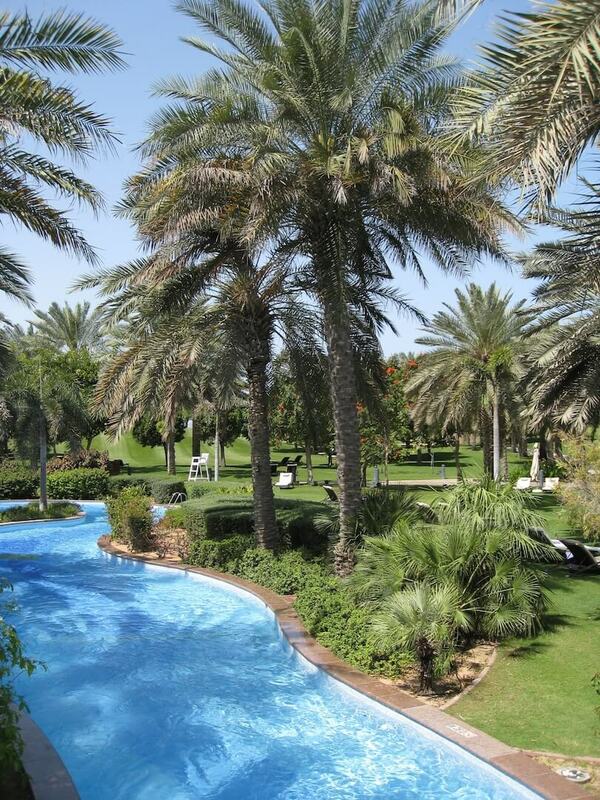 As well as being home to a pretty impressive family pool, there’s also a decent sized network of child (and husband!) friendly water slides. There’s also a lazy river, complete with a choice of floating rings or pool noodles to gently wash you around on a journey through the impressive green and well kept sprawling landscape. 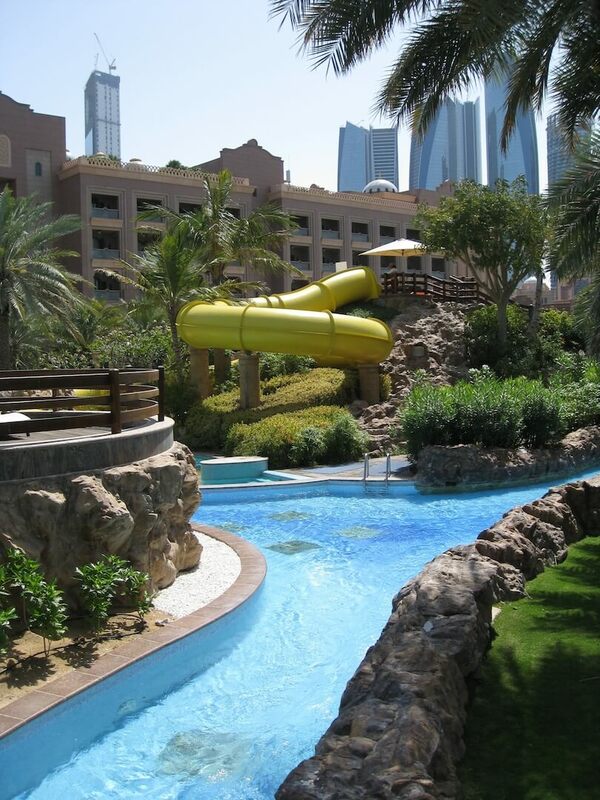 If you’ve got kids in tow that are over the age of five, you’ll love the fact that the ever helpful and trained staff at Sarab Land will take the kids off your hands and keep them entertained for as little or as long as you like, leaving you to float around on the lazy river, relax in peace by the pool or maybe even get in a few shots on the waterslides while the kids are out of sight. There’s a range of activities catering to the discerning tastes of every small person – jewellery making, bird watching, sandcastle building, giant jenga, table tennis, football, henna painting, arts and crafts, camel rides and more. 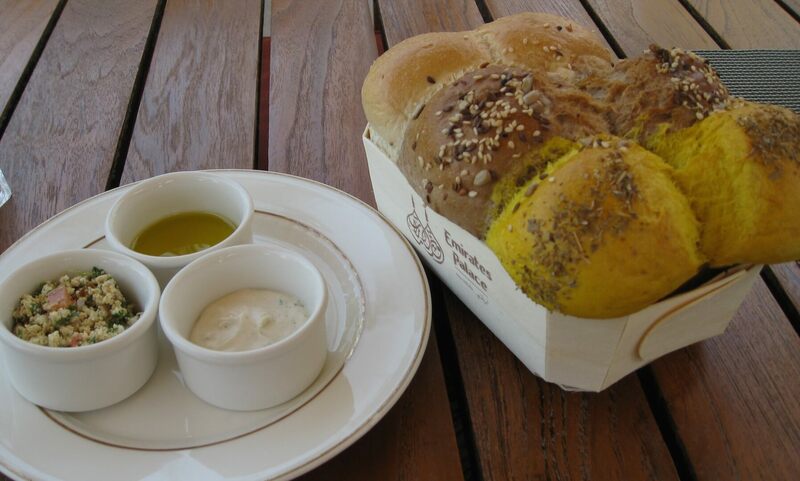 The Cascades pool bar and restaurant offers a wide range of snacks and light meals, each meal starting with that days choice of freshly baked breads, the ‘unusual’ flavour for our day was turmeric, although beetroot bread is another favourite of the outlet. 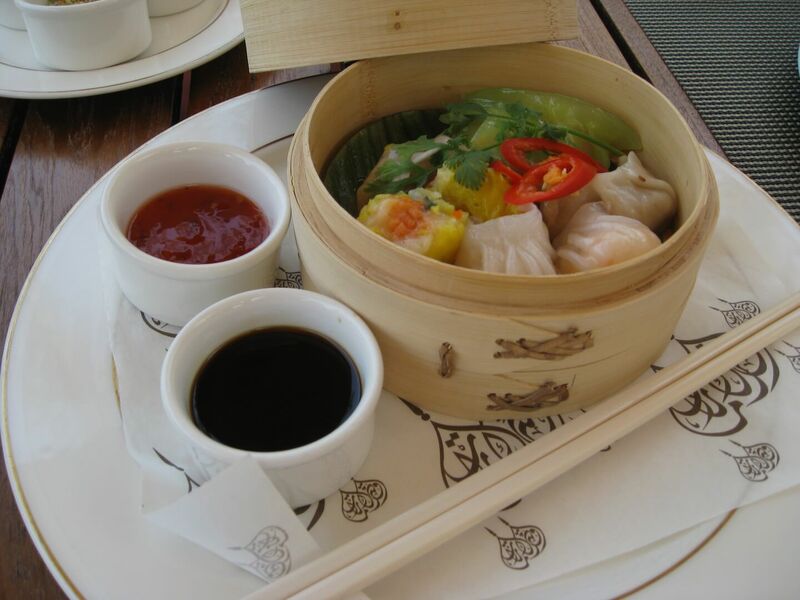 We started with the assorted dim sum which was served up fresh, piping hot and tasty with a choice of soy sauce or sweet chilli dips. Followed by barbecued prawn skewers for Mr. Arabian Notes which spoke for themselves by the speed with which they were devoured! 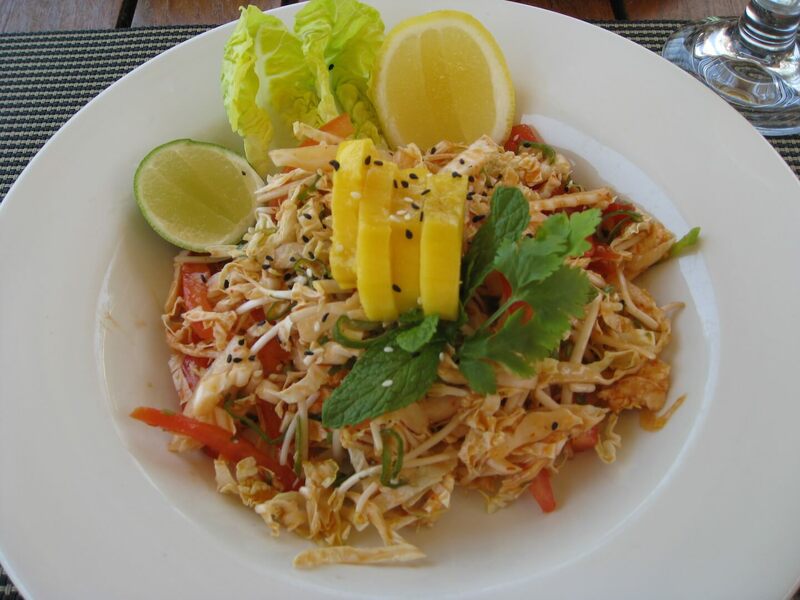 And a deliciously light and refreshing thai style chicken salad for me – hand pulled chicken, chinese cabbage, tomato, onion, bean sprouts, mango, mint and sesame seeds with a Thai chilli dressing. The flavours were amazing – yum. 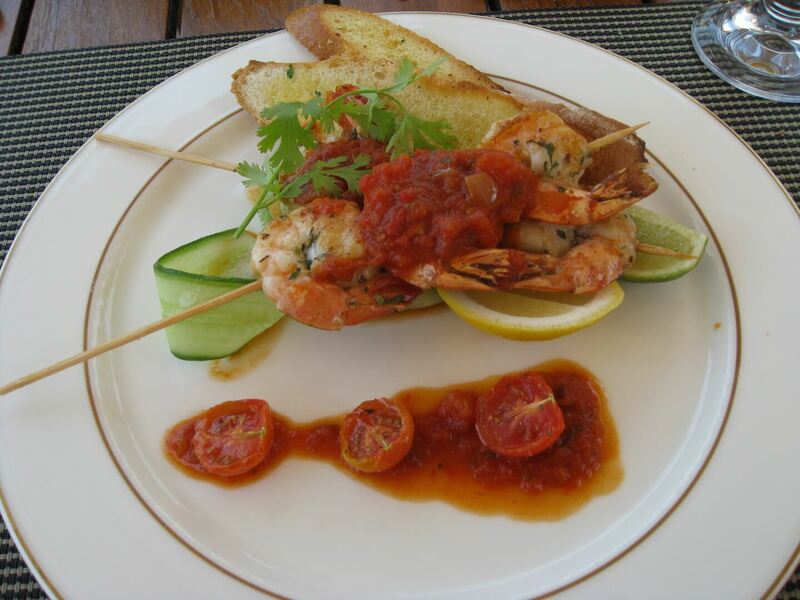 One of those great dishes that leaves you satisfied and avoiding that feeling of needing to be rolled back to your lounger…! The West Beach Club is definitely a great place to go if you have kids and are looking for a beach club with a difference – and a good excuse to get some pool and relaxing time on your own while the kids are kept amused by someone else for the day. Don’t forget the beach too, the west end of the beautiful 1.3km beach – which is where all the water sports for the hotel are located, so this is also the place to be if you fancy trying some kayaking, stand up paddling or other water sports. These do come at an additional cost but can also still be enjoyed without beach club access by booking your chosen water sport in advance. 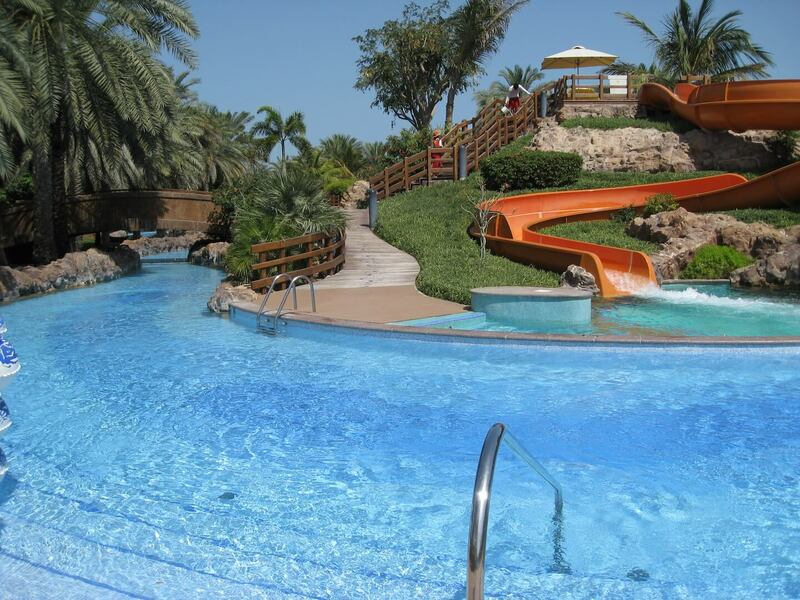 Day passes cost Dhs700 per adult and Dhs500 per child.